Morecambe defender Steve Old has put pen to paper on a new two-year deal at the Globe Arena. The centre-half became the latest player to commit his future to the club following Monday morning’s announcement. He follows Barry Roche, Alex Kenyon and Kevin Ellison in signing on at the Globe Arena with decisions due from Andy Fleming and Luke Conlan. 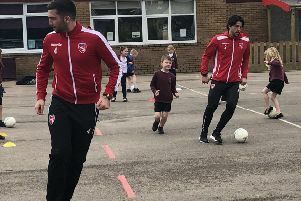 “Steve settled into life in the Football League superbly well and was at the heart of a defence that performed well all season,” Morecambe boss Jim Bentley told the club’s website. “One of our key objectives in the close season was to secure his signature and we are all delighted that he has agreed to stay.